Every issue, we invite on member of the college community to share their delight in an object found on campus. Here, Tim Flood (Geology) speaks to the banded iron formation that was collected from the Upper Peninsula of Michigan. Despite years of studying rocks, he still finds some, such as this formation, that are particularily beautiful. 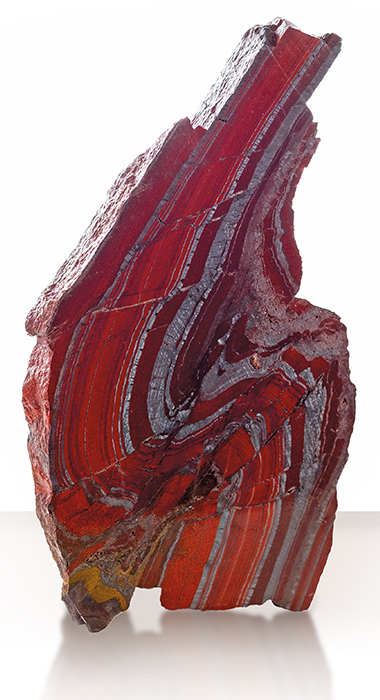 We collected this sample of banded iron formation (BIF) from the Upper Peninsula of Michigan. It’s 2 billion years old. This is the rock that is the evidence for the first oxygen in our atmosphere. Algal bacteria began giving off oxygen that bonded with free iron in the ocean, like rust, and settled to the seabed. Then this sample got deformed into a nice fold. Now, almost all the world’s steel is produced from BIF. It’s a fabulous tool for teaching about earth history. The red is hematite. The shiny black is magnetite. Then, some of the real bright red is jasper. Even though I’ve been studying rocks for 40 years, I still say, some of them are just doggone beautiful. 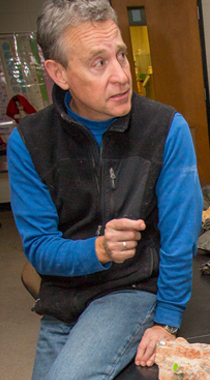 Tim Flood joined the faculty in 1987. His research interests focus on the geochemical processes that lead to the formation of continental crust, and on the teaching of geology.